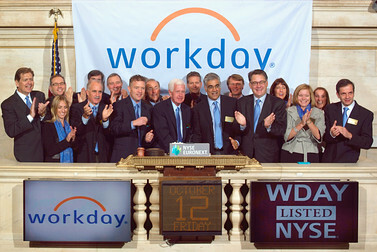 Friday morning, Workday executives opened the NYSE and their market valuation quickly rose to a staggering $ 8 billion. To me, it was a fitting cap to a fascinating month in enterprise technology punctuated by Dreamforce, Oracle OpenWorld and several other events. At least that is what I got from a conversation with Mark Hurd at OOW. Talking about SaaS vendors he said they only support a handful of the 750 business processes he presided over when he was at HP. Since he left, HP has announced plans to implement both Salesforce.com and Workday, but Mark is right. HP and other large, global companies have all kinds of complex supply chain, lab, warranty and other vertical processes (see excerpt of HP’s supply chain complexity from my recent book) so far untouched by SaaS. Moving on to infrastructure when I asked him how Oracle would compete against Facebook and Google cloud efficiencies (also excerpted here and here from my book) he pointed out enterprise customers have not benefitted from those (primarily) consumer tech offerings. Amazon, Rackspace on the other hand, he feels, have only “mildly interesting” offerings for the enterprise. Those are second half opportunities. Yes it is half time. And Clint Eastwood looms large. There is the inspirational Clint from the Chrysler Super Bowl commercial promising things will be much different in the second half. And there is the mocking Clint from the RNC – the one of empty chairs, or in our case empty clouds. Mark, Hasso, Ginni and Steve have plenty of reason to keep the second Clint far away. And Meg presumably does not just want to be a bystander. It should be an interesting second half.